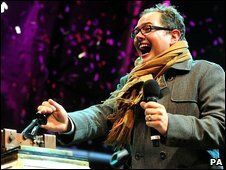 The Blackpool Illuminations have been turned on by comedian Alan Carr, watched by a crowd of thousands. Ex-world boxing champion Ricky Hatton was a surprise guest at the event and said as a regular visitor to the resort it was a proud moment for him. The famous lights, which stretch for six miles along the seafront, will remain lit for 66 nights. Earlier, BBC Radio 2 DJ Chris Evans had to abandon plans to broadcast live from Blackpool Tower because of high winds. Evans had a studio set up at the tower for his early evening broadcast as a build-up to the switching-on of the illuminations but the tower was closed because of the winds and the DJ had to return to his studio in London for his show. Comic and chat show host Carr, who also has a show on Radio 2, lived in the resort when he was 13 when his father Graham was manager of Blackpool Football Club. The 33-year-old told the crowd of thousands how he had stopped a suicidal man from jumping off the pier on a previous visit to the town. "It is lovely to be back in Blackpool," he said. "Last time I was here me and Lionel Blair saved a man's life. He was hanging off the pier saying he wanted to die and we went over and pulled him off. "And do you know what, he was ever so thankful and he lived, so what a lovely story." Manchester boxer Hatton was greeted by chants of "There's only one Ricky Hatton" from the crowd. He said: "It makes a change putting lights on rather than putting lights out. "I have been coming to Blackpool since I was a boy so it has been a very proud day for me." The illuminations, which cost £2.4m to stage, include more than a million bulbs and stretch for almost six miles from the Golden Mile. Bands and singers including Madness, Tony Christie, Pixie Lott and X-Factor finalists JLS performed during the night's festivities, which were broadcast on Radio 2, despite Evans' plans to present his show from the tower having to be abandoned. The DJ said: "I went to open the car door and the damn thing was nearly ripped from its hinges. Wind like you wouldn't believe. "I used to come to Blackpool almost every year with mum and dad for our hols but I have never witnessed wind like that before." 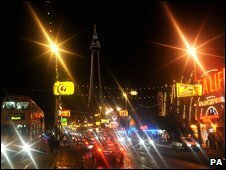 Blackpool first became famous for "electric sunshine" in 1879 when the council replaced eight gas lamps on the promenade with dynamo-powered bulbs, emitting the equivalent of 48,000 candles. The modern display of illuminations was first organised in May 1912 when 10,000 bulbs were arranged to mark the visit by Princess Louise, daughter of Queen Victoria . The illuminations will remain switched on until 8 November. The town's council has arranged a number of free events in the resort to tie in with the switch-on. The World Fireworks Championships and two days of beach volleyball tournaments are due to take place over the weekend.